Memories – My First Pet – Ginger? I was recently asked about my first pet. 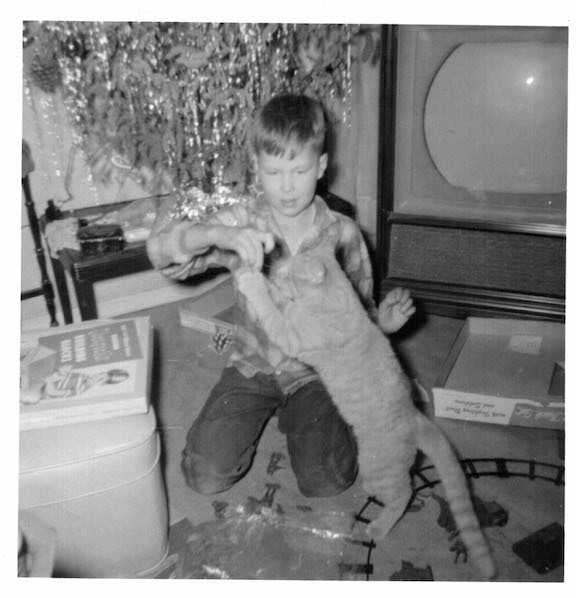 I thought immediately about “Ginger,” a ginger colored cat we had back in the late 1950s. Not only did Ginger love to play, but she liked to “hang out.” She was a great cat. I knew that I had a couple photos of her so I decided to find them. When I found photos of Ginger I realized a previous blog I wrote was wrong. When I wrote about my first television a couple weeks ago I completely forgot about having a television while we lived in Fridley. There, in the background of me playing with Ginger, was a television. Oh my. I then thought about memories and how we often need triggers to recall them. Because of that photo with Ginger, I knew that we had a television years earlier than I had recalled before. I don’t recall watching it, but now I know we had one. That makes me wonder about what was my first pet. I know about and remember Ginger because I have photos of her and me together. I remember that Christmas and her being totally freaked out by the electric train set I received that year. However, I believe that I remember Ginger, that Christmas, and the train set because I have reinforced that memory through seeing these photos over the years. So, was Ginger really my first pet, or did I have pets before her that I don’t remember because we don’t have any photos? Certainly, it is possible. 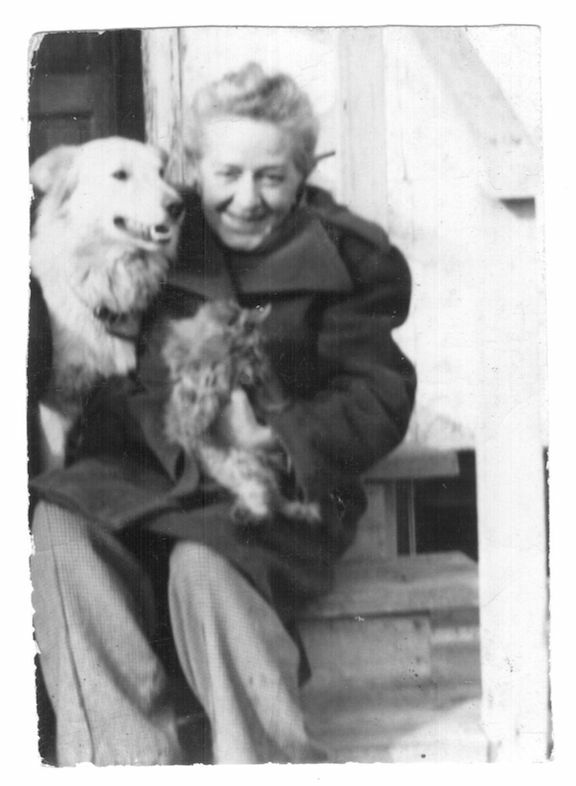 I have a photo of my grandmother with a dog, Wolf, and a cat. It is from about 1951. My grandmother lived with us then so we must have had pets then. I just don’t recall either of them. The photo makes me wonder just how long we had Wolf and that cat. Were they replaced when I was a child and I just don’t recall them because we don’t have any photos of them? Maybe, maybe not, I just don’t know because I don’t have the photos to trigger those memories. I guess the take away from this is that there is a need to take photos of family members, particularly young ones, with their pets. Those photos may be the basis for warm memories for their entire lives. 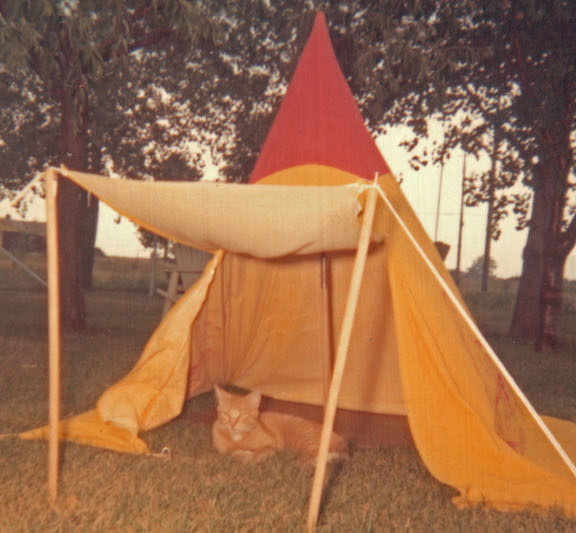 Memories like my playing with Ginger on Christmas morning or memories of Ginger hanging out in my tent. My niece Kerresa: Oh so many pets I guess the first pet of mine would be Dee Dee the extra furry pony when I was around five. I don’t remember how it got named Dee Dee maybe because she/he walked soooo slow. But my mom and aunt have always been into horses so naturally I loved it. My sister-in-law Liz: The family has always had either a couple of cats or a dog. Sunbug and George were the cats I grew up with and Tesha was our dog, My own cat wasn’t until I got Casey for Christmas when I was living in the Brookside building in the 90s. That cat went everywhere around the old Down East building with me. My great niece Maggie: The first pet that I remember was a cockatiel named Amadeus. I was 6 or 7, I think (maybe [Libby] can confirm that), living in Indiana. I chose that name because I had recently seen the movie. Take lots of photos of family members interacting with their pets and print those photos for permanent use.